The Museum of Sacred Art was created by an agreement between the Municipality of Tavarnelle Val di Pesa and the parish of San Pietro and Santa Lucia in Tavarnelle, with the collaboration of the Archbishop’s See of Florence, the Regione Toscana, the Office of Architectural and Environmental Heritage and the Office of the Artistic and Historical Heritage of Florence. Inaugurated in 1989 on the first floor of the rectory of San Pietro in Bossolo, the Museum has collected artistic objects, which come from the ancient parish of San Pietro and from that of San Donato in Poggio. The institute grew out of the desire to catalog, conserve and protect the artistic heritage of the province and the Florentine surroundings. The Romanesque parish church has three naves divided by five equally wide spans, supported by simple quadrangular pilasters with low plinths that jut out and a simple frame at the top in place of the capital, another ornamental motif is a molding with abrupt changes in width that follows the bowing of the arch along its upper surface. From the cloister, one can enter the rectory, which houses the Museum of Sacred Art. The legacy of the mother church is represented by the precious pieces of jewelry, among which are found an astylar cross datable to the 13th century, some reliquaries of carved wood and some examples of liturgical vestments belonging to ancient paraments. Among the admirable pieces of silverwork are two astylar crosses from the 1200’s, their engravings portray the usual iconography of mourners at Christ’s side and the symbols of the four evangelists at the ends of the limbs, a high-footed chalice decorated with both straight and undulating lines from the 15th century that still retains the enamelwork on its stem joints; two thuribles, also from the 15th century, one temple-shaped and the other vaguely pyramidal, still following a 14th century model. 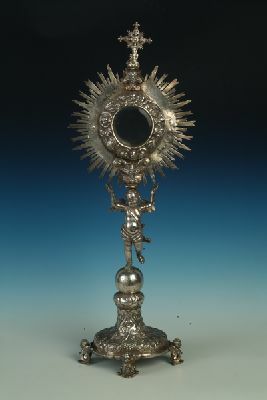 A considerable number of Florentine and Tuscan furnishings from the 1600’s and the 1700’s are also present; some outstanding pieces are a chalice from San Bartolomeo in Palazzuolo and some Neapolitan silverwork from the 19th century, with the exception of the beautiful monstrance made by Nicola De Angelis in 1706. Two glass cases dedicated to “Tavarnelle embroidery”, an ancient and traditional artisan activity, have been placed in the entrance hall. 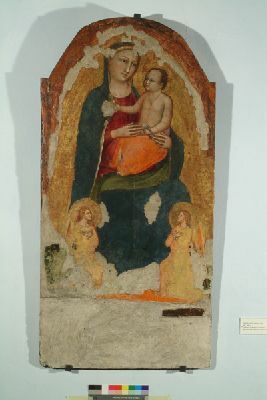 The Parish has always owned two works of great artistic value: the Madonna delle Grazie painted in the first half of the 15th century by Rossello di Jacopo Franchi and a 13th century wooden panel depicting the Madonna with Child, attributed to Meliore (1270-1280 ca.) 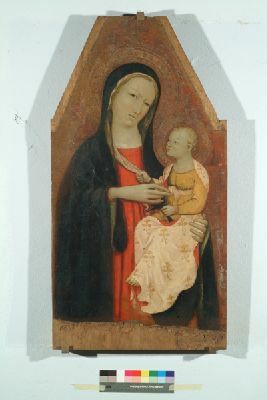 Two other works worthy of particular attention are the Madonna with Child attributed to Lorenzo di Bicci, from about the end of the 14th century, and a series of six paintings done by Neri di Bicci in the 1470’s. 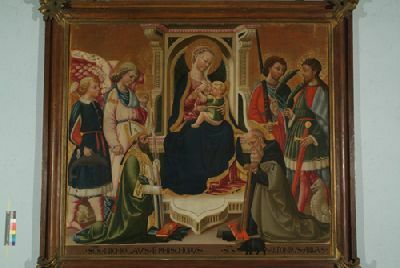 There is an altarpiece from the disused church of San Martino in Cozzi, the Madonna on a throne between Saints Martin and Sebastian. 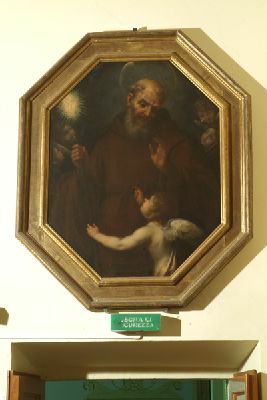 It was completed by an unknown artist, later named the Master of Tavarnelle after this painting , who also has another admirable work, (Saints Anthony the Abbot, Sebastian and Rocco) in the Museum of Sacred Art in San Casciano. 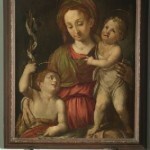 A small but important painting is dated towards the end of the same century (1580 ca. 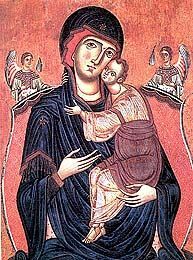 ), it depicts the Madonna with Child and Saint Giovannino and is attributed to Jacopo Chimenti, known as Empoli. 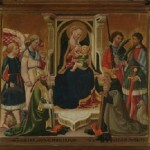 The oldest of the works belonging to the parish of San Donato in Poggio is the triptych representing the Madonna with Child between Saints Peter and John the Evangelist, attributed to Ugolino di Nerio. From the same church come: four 17th century paintings from the Tuscan School showing the Evangelists flanked by their respective iconographic symbols; two octagons with San Francesco di Paola and the Sacrifice of Isaac, attributed to Giovanni Montini, a Florentine painter active between 1600 and 1650; the Presentation at the Temple done by Alessandro Gherardini at the end of the 17th century; a contemporary painting from the Florentine School portraying the Assumption of the Virgin, and a small wooden panel, dated 1874, that depicts the Sacred Heart of Mary. In addition to some 18th century paintings, a Madonna with Child seated on a throne between Archangels Raphael and Gabriel has come from the Church of San Lorenzo in Cortine; it is datable between 1470 and 1480 ca. 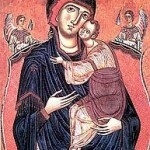 and is attributed to the Master of Marradi. A third room is dedicated to sacred furnishings and hosts a large group of reliquaries in wood and silver and some canvases that depict images of faith: the 18th century Saint Laurence that comes from San Lorenzo in Cortine, and the Saint Peter of Olena, a work signed by Stefano Amigoli in 1770. 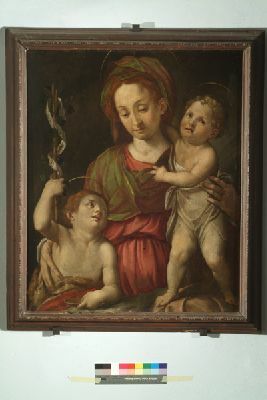 The other two small wooden panels in the room, which depict Saint Luke and Saint Mark, belong to a 17th century series of the four evangelists painted by an unknown painter of the Tuscan school. 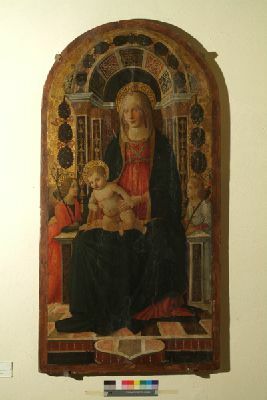 The hallway in the rectory, dedicated in part to the figurative documentation of popular piety, is dominated by a 16th century wooden panel with the Madonna and Child between Saints Rocco and Albert of Sicily, attributed to the circle of the Florentine painter, Antonio del Ceraiolo, for the Brotherhood of the Assumption of Mary. Other three ex-voto paintings, important indications of the faith and of the popular favor given to the Virgin of Morrocco, commemorate such important miraculous events as deliverance from the plague of 1630-1633, the miracle of an bedridden woman in 1744 and the appearance of the Madonna with Child to a believer in 1747. In addition, the hallway holds significant examples of 17th and 18th century liturgical fabrics of Italian manufacture. Storia e cultura della strada in Valdelsa nel Medio Evo. A.A. V.V., Poggibonsi-San Gimignano, Editore: a cura di R. Stopani, 1986. 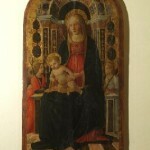 Il Museo di Arte Sacra a Tavarnelle Val di Pesa. Proto Pisani R. C., Firenze, Editore: Becocci/Scala, pagine: 64, 1989, note: Biblioteca de “Lo Studiolo”. 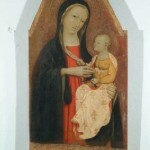 Il Museo d’Arte Sacra a San Casciano Val di Pesa. Proto Pisani R. C., Firenze, Editore: non disponibile, 1989. Size: 25 cm. x 13 cm. 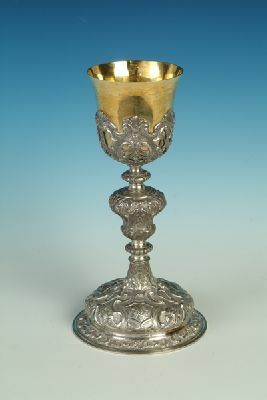 Chalice with a round foot decorated with leaves on the outer border and with volutes and scrolls around the symbols of the Passion on the surface. Size: 98 cm. x 75 cm. 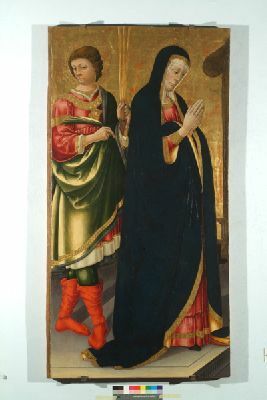 Attributed to the famous Florentine painter Meliore, this painting is of notable importance for the history of 13th-century Florentine painting. With its last restoration in 1995, the painting reclaimed its prized colors and antique gold highlighting, emphasizing its similarity to Byzantine prototypes, together with the typically western type of volumetric refinement. Size: 117 cm. x 58.4 cm. 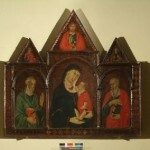 The central part of a polyptych, it was repainted in very ancient times and radically transformed in the 18th century because of a change in tastes. Size: height 58 cm. ; rays: 21cm. x 27 cm. ; base: 18 cm. x 16 cm. This monstrance with a bell base has four cherub-head feet resting on vaults. 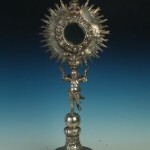 The body of another cherub forms the monstrance shaft and supports the sunburst surmounted by a small cross. Size: Presentation at the Temple: 235 cm. x 176 cm. ; Sacred Heart of Mary: 57 cm. x 47 cm. 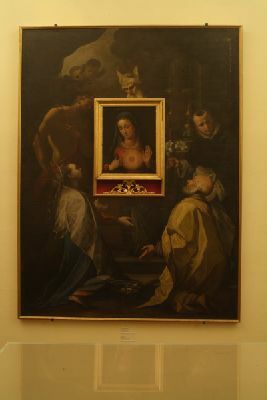 Dating to about 1698, the background painting has a central opening at the back to allow the placing of a religious image. In this case, it is the Sacred Heart of Mary, an oil painting on a wooden panel, dated 1874. Size: 116 cm. x 93 cm. 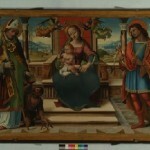 Octagonal painting in the original frame of carved and gilded wood. 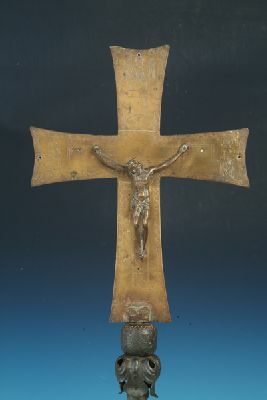 Romanesque cross in gilded copper with a plastic figure of the Crucified in relief, applied afterward in the 19th century. 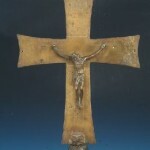 The cross is engraved on both the front and back. 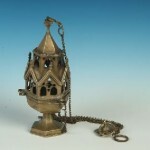 It displays geometrical decorations, figures of the mourners, and the symbols of the four Evangelists. Size: 89.5 cm. x 71 cm. An object of deep devotion in the town, this painting underwent many changes over the centuries. It was enlarged and repainted according to the fashion of the time. 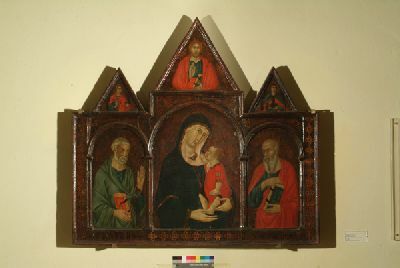 It was only in 1995 that a restoration brought back its original aspect with the cuspated support, indicating that the panel was the central section of a polyptych. Size: 141 cm. x 159 cm. Saint Anthony the Abbot; Saint Julian; and Saint Domninus. Both the predella and the monumental frame were probably lost when the altars of the Church of Santa Maria in Morrocco were modified. Size: base: diameter 25 cm. x 7,6 cm. ; brazier: diameter 25 cm. x 10,3 cm. 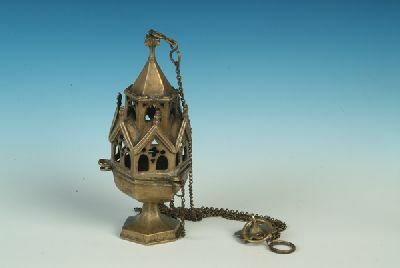 This thurible has a smooth hexagonal foot with a step, a hexagonal brazier, and a lid in the shape of a two-story tempietto with six pointed faces and single- and double-lancet window fretworks. Size: 109 cm. x 119 cm. 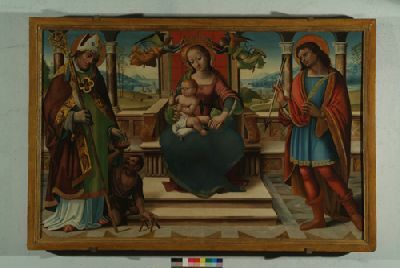 The triptych’s carpentry, decorated with geometric motifs, is a rare and interesting example of an original painted and carved frame. Compared to the other works attributed to Ugolino di Nerio, its somewhat provincial tone, a certain simplification of the garments and its not very high quality argue in favor of the workshop’s extensive involvement. Size: 143 cm. x 74.1 cm. This painting, together with the one depicting Saint John and Saint Roch, was originally part of a single wooden panel, as revealed by the traces of symmetrical decorations on the internal edges. It probably had a Crucifixion in the center, as the presence on the sides of the Virgin and Saint John as mourners would lead us to believe. Size: 74.2 cm. x 59.5 cm. A small painting reminiscent of Pontormo’s style. Size: 89 cm. x 132 cm. This artist’s French origin is confirmed by Saint Martin’s unusual iconography. In fact, the saint is represented neither as a Roman legionary nor as a knight in the usual act of sharing his mantle with a poor man, but instead as the bishop of Tours giving an offering to a lame beggar. This painting is also characterized by great delicacy in the meticulous and analytic depiction of the landscape. Size: 19 cm. height; base: diameter 7,3 cm. ; brazier: diameter 13.5 cm. 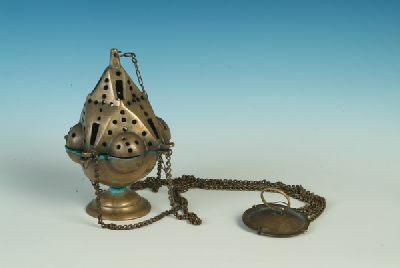 This thurible has a smooth round foot with a step. 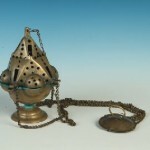 The brazier is a lobed hemisphere; the fretworked lid is vaguely pyramidal. Size: 140 cm. x 70 cm. This Ghirlandaio-style curved panel is very charming thanks to the extremely decorative depiction of the Madonna enthroned with Child, who are flanked by the Archangels Raphael and Gabriel. There is abundant use of stamping and gilding as well as of artisanal techniques in the rendering of the painting. By car: Take Firenze-Siena highway from Firenze Certosa and exit at San Donato. Turn at the bridge and continue towards the town of San Donato in Poggio.